A final score doesn't always give an accurate description of a game. Take the Weston boys basketball team's matchup against host Ridgefield in the Ridgefield Holiday Tournament championship game Thursday. Although Weston lost 65-41, the game wasn't a mismatch like the final score would convey. The Trojans trailed by only 10 points at the start of the fourth quarter and hung with Ridgefield for most of three quarters. In the end, the Tigers, who raised their record to 5-0, bottled up Weston (4-1) in the fourth quarter on both ends of the court, and put the game away. "The score doesn't tell the tale of the game," Trojans coach Mike Hvizdo said. 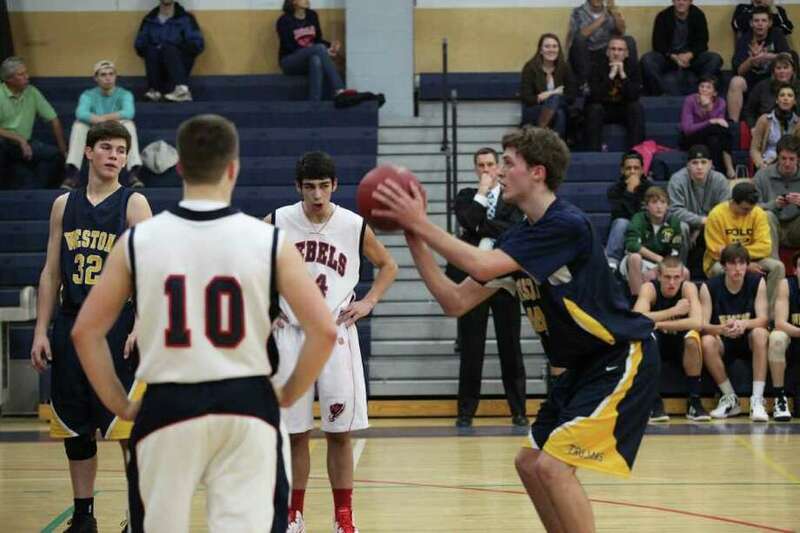 "We continued to play hard the whole game, and played an intense man defense, which Ridgefield hasn't seen all year. Going into halftime down six and into the fourth quarter down 10 showed we were in the game." This is Ridgefield's third straight tournament victory (the tournament rotates every year between the four participants, which includes Staples and Newtown, who played in the consolation game). Tigers coach Carl Charles, who coached Weston until 2006, is the architect behind the tournament champion's success. "They [the Trojans] played aggressive and hard, but defensively, we were finally able to wear them down," Charles said. One thing that worked against Weston was the absence junior shooting guard Charlie DiPasquale, who was home because he was sick. "That's another reason why we lost," Hvizdo said. "Not having our leading scorer didn't help. We had to start a sophomore for the first time. He did well, but Charlie was missed." Ethan Lee Tyson, who is normally a reserve, is the sophomore Hvizdo referenced. Tyson (two points, three assists, one steal) did some good things in the early-going. Ridgefield led from start to finish and forced 11 Trojan turnovers in the first half, 16 overall. "We had too many turnovers, and it changed the pace of the game," Hvizdo said. Senior captain Seth von Kuhn (14 points, three rebounds, three assists) led the Tigers and was named the tournament MVP. Junior Kurt Steidl 13 points, six rebounds, two assists, one blocked shot) complemented von Kuhn by leading the defense with three steals, which led to many Ridgefield transition layups off backdoor cuts. Steidl was responsible for forcing a good chunk of the Trojans' turnovers and also absorbed a charge. Weston senior captain Max Molinsky (11 points, two rebounds, three assists, two steals, one blocked shot, one tieup, one forced turnover) swished a 3-pointer to make it a single digit game, 17-9, to start the second quarter. Molinsky was named to the All-Tournament team and helped ignite a comeback attempt in the quarter by playing tight defense and setting up sophomore Asher Lee-Tyson's (Ethan's twin) layup to cut the lead to five, 21-16. After Ridgefield pushed it back up to nine, Molinsky drained a trey from Asher Lee-Tyson (two points, two assists, one forced turnover). Molinsky set up senior captain Lyle Mitchell's (10 points, four rebounds, one steal, one forced turnover) to make it 27-21 at the break. Mitchell was also on the All-Tournament team. The Trojans were tough defensively, forcing 14 Tiger turnovers, 10 in the first half. Sophomore Troy Flynn (five points, two rebounds, two steals, one charge drawn) also made his presence felt on defense and helped Weston keep it close. One sophomore who is regular starter for the Trojans is Erik Dammen-Brower (five points, three rebounds, one assist). The small forward Dammen-Brower made it 27-23 to start the second half but Weston didn't get any closer. Ridgefield pushed the lead to 14 before Molinsky hit two free throws and then set up Mitchell's layup to end the quarter at 43-33. However, that was only a temporary reprieve before the Tigers pulled away. Senior captain Evan Blitzer (five points, two rebounds, one steal) hit a 3-pointer for the Trojans. Also contributing were senior J.D. Simons (one point) and sophomore Grant Limone (one rebound). "We have to make more shots," Hvizdo said. "Ridgefield is a very good team and should do well in the FCIAC. We hope to learn from this and come out on fire."